Comedy Central is ready to hit the bottle once again. 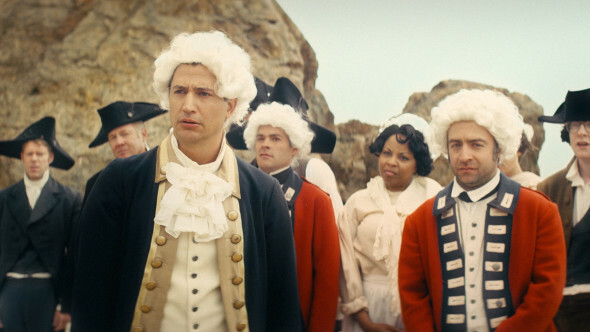 The network just released a new trailer for season six of Drunk History. Season six of Drunk History premieres on Comedy Central on January 15th at 10 p.m. ET/PT. · Vanessa Hudgens and Rachel Bilson as sisters Marge & Helen Callaghan knocking it out of the park in their reenactment of the start of the All-American Girls Professional Baseball League. · Amandla Stenberg as Elizabeth Eckford, one of the nine African American students who were the first to attend Little Rock Central High School in 1957, also known as the Little Rock Nine. · Alison Brie & Sugar Lyn Beard as Thea Spyer and Edith Windsor, the married couple who fought for LGBTQ rights. After Spyer’s passing, Edith challenged the Defense of Marriage Act and won. · Josh Hartnett as Joachim Neumann who rescued his girlfriend and escaped to West Germany through the “Tunnel 57″ under the Berlin Wall in 1964. · Q’orianka Kilcher as LaNada Means, a student leader at UC Berkeley who organized the Third World Strike, which ultimately led to the development of the Ethnic Studies Program. What do you think? Are you a fan of Drunk History? Will you watch the new season?